Hawaiian Island Milk Bar 50% 2oz. Small farms in the Big Island’s Hilo region produce quality cacao from which their hand-select beans. Hawaii is the only state in the United States with a climate appropriate for cultivating the cacao tree. These beans were sourced from Tom Sharkey of Hilo Sharks Coffee and Colin Hart--whom we have sourced since 2015. Sharkey and Colin harvest pods from 6 farms in the Hilo Paliku area, which spans from the Wailuku River to Hakalau and the Puna District. They return to Sharkey's farm to crack and extract wet seed before loading the fermentation boxes. Sharkey and Colin maintain the orchards and manage the post-harvest handling, which is paramount for quality. 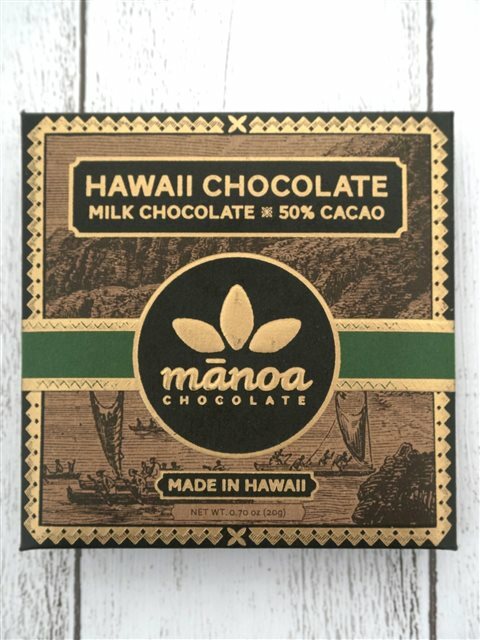 Manoa Chocolate Hawaii is a bean-to-bar chocolate factory. They’ve been making quality, dark chocolate in Kailua, on the windward side of Oahu since 2010. Their gave their company this name in reference to the depth of flavor and complexity found in dark chocolate. ・Please note that we can not accept any exchange or return unless you get defective or wrong item. Quantity restrictions may apply depending on country.